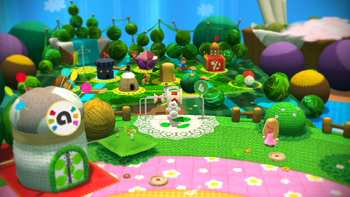 World 4 is the fourth world of Yoshi's Woolly World. It is a mostly jungle-themed world, featuring elements related to forests and water. As in all other worlds, there are nine levels: eight compulsory, and one special level that is unlocked after all other Smiley Flowers in the previous levels in the world are collected. Completion of this world unlocks World 5. Monkeying Round and Round A forest level with many ropes and Ukikis. Lakitu Peekaboo An underground level with many Wall Lakitus. Rollin' Down the River A rapids level that features Lunge Fish and paddle wheels. Knot-Wing the Koopa's Aqua Fort A fortress level where Knot-Wing the Koopa is fought a second time. Sunset at Curtain Falls A level where Yoshi must ride curtains and avoid Fangs. Spooky Scraps! Don't Get Spooked! A level where certain shades reveal platforms and beads but make enemies invincible. Yoshi Branches Out A forest level where Yoshi must utilize certain moving arrow circles to advance. Naval Piranha's Sewer A sewer castle level where Naval Piranha is fought. Naval Piranha 2: Now It's Personal! A special level in which Naval Piranha chases the player. This page was last edited on July 10, 2018, at 07:23.